Howard County Sports Hall of Fame Class of 2012: (left to right) George Phares, Greg Bell (Distinguished Service Award), Brian Hogan, Crissy Klein, Leon Troyer, Tia Davis and Chris Boneham. KOKOMO, Ind. 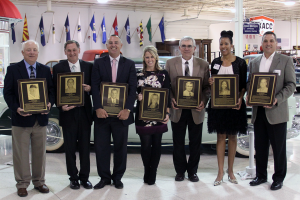 – For the 10th time, the Howard County Sports Hall of Fame inducted a class of athletes and coaches who set the bar in their respective sports. With six state championships, five NCAA Division I scholarships, thousands of wins, at least 16 high school and eight college conference titles, one Rose Bowl victory, three state records and one memorable upset of Duke, the 2012 induction class shows once again the depth of athletics in Howard County. When the names of George Phares, Chris Boneham, Tia Davis, Leon Troyer, Brian Hogan and Crissy Klein are mentioned, they will be remembered for the legacy’s the left as great Howard County athletes and coaches. They will be remembered as six of the now 60 members of Howard County’s finest. They will be remembered as members of the Howard County Sports Hall of Fame. Phares enters the HCSHF as one of the most successful coaches in the history of Taylor High School and Howard County. He accumulated 537 wins as the Titan baseball mentor, including 11 conference titles. But one win in 2000 stands out among his 656 career victories – a 12-1 win over North Montgomery to claim the IHSAA Class 2A baseball state championship. The title still stands as the only state championship in school history. His coaching duties were not limited to baseball, as he coached the girls golf team for 24 seasons, taking three squads to the non-class state finals and garnering a third place finish in 1993. He also coached the girls basketball team for two seasons, earning a pair of conference titles and a 36-6 record. The Shelbyville High School graduate said a scout from the Los Angeles Dodgers helped form his coaching philosophy. Phares retired from teaching and coaching at the high school level in 2007 and is currently an assistant coach at Indiana Wesleyan University in Marion. He and his wife Martha have three children. Boneham is one of the most successful swimmers to ever don a Speedo in Howard County. While swimming for Haworth High School and Indiana University, he claimed five state championships, and four Big Ten titles while earning college All-American status in 1986. While at Haworth, he helped lead the Huskies to the IHSAA boys swimming state title in 1982 – the school’s only team state championship. One year earlier, the Huskies were state runners-up. He was crowned the state’s best 50-yard freestyle swimmer in 1982 and 1983 with two of the top three times ever recorded at the annual state meet. And as a member of the 200-yard medley relay, he won two more state titles – this time in state record-breaking performances. Boneham was recruited by legendary IU swim coach James “Doc” Counsilman, where he swam on a pair of Big Ten championship squads. He also claimed a pair of Big Ten titles as a member of the 400-yard freestyle team, and earned All-American status in 1986 after he finished 12th in the 50 free and 14th in the 400 free relay at the NCAA championship meet. Today, Boneham works in the pharmaceutical field in North Carolina where he lives with his wife, Lisa, and their four children. Davis enters the Howard County Sports Hall of Fame after sensational basketball careers at Kokomo High School and the University of Toledo. While playing as a Lady Kat for 2004 HCSHF inductee Charlie Hall, Davis pulled down 633 career rebounds – a number that remains the second best in school history to the 888 of 2007 Hall of Fame inductee Debbie Benziger-Dudukovich. She scored 1,056 points while helping her squad win 81 games, two outright North Central Conference titles and a 1996 single-class Final Four appearance. At Toledo, she joined her second 1,000 Point Club as she tallied 1,099 points as a three-year starter. Her senior season, she earned All-Mid-American Conference First Team honors after averaging 18.1 points per game (third in MAC) and 7.1 rebounds (eighth in MAC). Her sophomore season, the Lady Rockets won the MAC and earned an NCAA tournament bid. As a junior, her squad upset No. 5 Duke thanks in-part to a 20-point Davis performance. Davis is a member of the University of Toledo Athletics Hall of Fame and played three season of international professional basketball. She currently works in retail in Lafayette, Col., after earning a master’s degree from the University of Nebraska, where she served as a graduate assistant coach. Troyer left Eastern High School in 1965 as one of its most successful athletes ever. Forty-seven years later, he still stands as one of the most successful Comet athletes in history after winning 11 letters in football, track and basketball. He played on the Eastern football team that set a school record with 37 consecutive wins and was named Indiana All-State twice. After the Comets lost its first game of Troyer’s freshman season in 1961, the coach put Troyer in the starting lineup and the program went 35-0 over the next four seasons. His senior year, he rushed for 1,182 yards in nine games. During his senior season, he was also a member of the 17-4 conference championship basketball team and broke the school record in the 100-yard dash (10.2 seconds). Troyer said one of his fondest memories was at the end of his junior football season and the team traveled to Jackson Central for a game between two undefeated teams. He said that the entire Greentown community drove early to the game with the bus, and by the time the Jackson Central fans arrived, the Comet faithful had filled not only all of the visitors bleachers but the home teams as well. “That is a memory I will never forget, the way Greentown followed us during that winning streak,” recalled Troyer. At Purdue, he played in 29 of 31 games (freshmen did not play during that period) with all three teams earning a Top 10 ranking in the final polls. The 1967 Boilermakers were co-Big Ten champions and he played in Purdue’s 14-13 Rose Bowl win over USC before 101,455 fans. Among his Purdue teammates were quarterbacks Bob Griese and Mike Phipps and All-American running back Leroy Keyes. Troyer is married to Marleen and he currently teaches science at Lafayette Jefferson High School. They have two sons. Hogan enters the Howard County Sports Hall of Fame as one of the smoothest shooting guards Kokomo High School has ever seen. The 1988 Indiana All-Star shot 46-percent from the field and 87-percent from the free throw line during a senior season that saw the Wildkats reach the single-class Elite Eight. He holds modern era school records (since the merger of Kokomo and Haworth) in most field goals in a game (14 against Anderson in 1988) and steals in a game (eight against North Central in 1987). He had 32-points against Anderson in 1988 which is the fifth highest output in the last 27 Wildkat seasons. Hogan played basketball for 2006 Hall of Fame inductee Carl McNulty and 2009 inductee Basil Mawbey. At the University of Florida, Hogan was graduated as the Gators all-time leading three-point shooter (120) and helped the team to the 1989 Southeastern Conference championship. In his senior season, the Gators reached the National Invitational Tournament Final Four in New York City, where he had an 11 point, five assist performance in a loss to Utah. Hogan was a team captain his senior season as Florida finished as SEC runners-up. Hogan currently is an attorney in Florida, where he lives with his childhood sweetheart-turned-wife Kristi and their four children. Klein enters the Howard County Sports Hall of Fame as the best female golfer in the history of the county. At Northwestern High School, she helped the Lady Tigers qualify for a pair of IHSAA girls golf state finals while also qualifying as an individual twice. At the University of Notre Dame, she ranks eighth all-time for the number of times she registered the low score for the Irish in an invitational tournament (eight). She was the team co-captain her senior season and finished as the squads number two golfer. She recorded low medalist honors in 1992 at the Bradley University Invitational and finished among the top eight at several tournaments. She continued her golf career as a Class A PGA Professional and played in the 1995 U.S. Women’s Open golf championship. She also set the women’s course record with a 7-under par 65 at the Ballentyne Country Club in Charlotte, N.C.
Klein currently lives in Westfield with her three children. After a successful career as a golf professional instructor, she is currently studying to earn a degree in elementary education. Coaching plays essential role in building one’s life. Whether you want to be successful in your business to increase your product sales and revenue or want to learn dance and singing or you just want to make a career in sports or it could be anything, coaching is a term where you should undergo and learn what you want. The concept of coaching is not new and a number of coaches having specialization in particular niche such as sports, health, business or career can be found. .